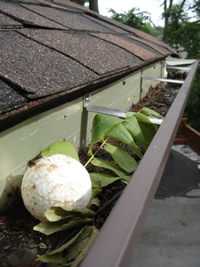 Many home owners overlook there gutters due to the access difficulties. Nobody knows more than we do the damage blocked and overflowing gutters can create, once water penetrates your brickwork and through to your internal plaster and decoration, because we see it all to often. Don’t take that chance, let us clean your gutters so they work correctly. Phoenix Gutter Cleaning Sussex can also carry out annual maintenance work which could save you a fortune on costly repairs caused by leaking water. Don’t risk a fall give us a call now for a free quotation. 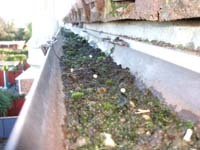 Domestic prices start at low as £49.00 for the first 10 metres of your gutter cleaning. Blocked downpipes cleaning is additional, as is unblocking drainage etc and we also carry out gutter and downpipe repairs. Our crew will turn up and set up the equipment then start the cleaning of your gutters once we cleaned your gutters we then report to you any defects or faults we think you should be made aware for future reference. We then leave your property clean and tidy. We do not require any use of your power. All our equipment is run off our own power source which is big saving for our customers. We start with a survey using a wireless video camera (see above), this shows us exactly what is in the gutter and its condition - you can see it too. We would recommend a clean up for the gutters pictured. Connect up the system and start cleaning. The vacuum system is safe for both wet and dry materials and can hold around 30ltrs of waste. A generator is available if access to mains power is an issue. Finally, we connect up the video camera again and check the gutters are thoroughly clean.